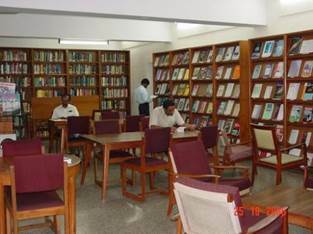 At the disposal of students there are university library and reading rooms. Students have free-of-charge access to the Internet in specialized rooms. The principal activity of data resource management is directed at the enhancement of data and internet work of the University for the provision of a controlled, informative and analytical university system. This activity is also aimed at the perfection and enrichment of the informative and resource potential of the University via the creation of an online laboratory, new computer rooms, Internet halls and electronic reading rooms. - Computer rooms –307, 309, 312(34 computers). - Multimedia rooms– 308, 310 (12 computers). Online (interactive) blackboards are installed with map-cases and projection apparatus. - Free of charge Internet halls– 311, 313 (24 computers). Unlimited Internet call flow capacity is provided. There is an operating schedule of rooms for teachers and students from different departments. - Multimedia room – 314. Supplied with 40 computers, map-cases and projection apparatus. - Video room– 316. Equipped with modern, five-channel volume and widescreens. There are also comfortable armchairs for recording. - Mini-conference hall– 315. Supplied with “Taiden” equipment used for simultaneous translation. There is a roundtable, a rostrum for chairman and a cabin for interpreters. 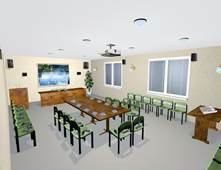 The mini-conference hall is supplied with a projection apparatus, screen and loudspeakers. The hall is used for conferences with simultaneous interpretation into two languages. - Lecture-rooms–314(main building), 314(3), 412. Supplied with projection apparatus 3m by 2m widescreens and microphones. The principal activity of the TV-technology department is designed for the shooting and montage of video lectures, University arrangements and work with students. The University audio store includes audio cassettes recorded by native speakers and teaching staff. An equipped studio functions at the University for the effective enrichment of the audio store. Currently, the catalogue includes 278 titles in total. Through the programmes “Electronic documents circulation” and “Resource Centre”, students can read information in English, Kazakh, and Russian. Further, the website ablaikhan.kz contains news and answers in a forum format. Information in English, Kazakh and Russian has been updated on the webpages of all departments, chairs and academic, as well as the page for enrollees. The programme “Electronic documents circulation” is used for the business correspondence of University members. The programme contains the University Plan, University administration decisions and the Academic Council’s decisions.